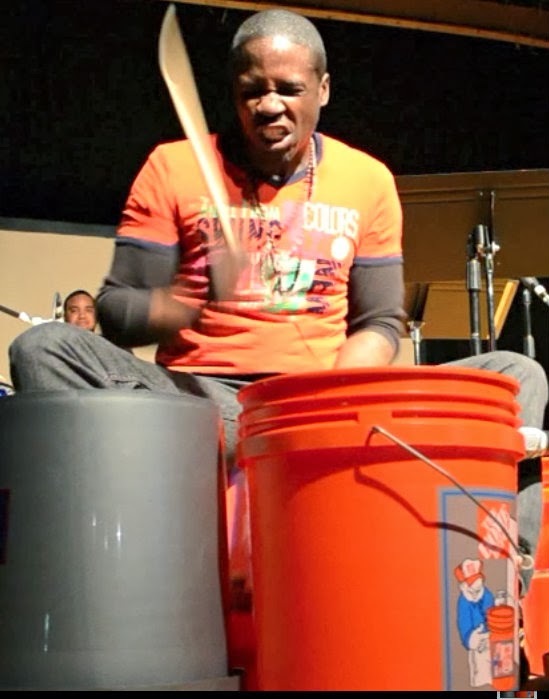 Choclattjared the number 1 Bucket Drummer In the world!!! Choclattjared aka Jared Crawford is a percussion prodigy and music composer who began performing at the formative age of three. He first gained recognition as one of the world-renowned bucket drummers of the subway stations and streets of New York City. From there, Choclatt co-stared and created all of the on stage percussion segments in the 4 Tony Award winning musical, "Bring in Da Noise Bring in Da Funk" and he is also the creator of the critically acclaimed musical "Keep Bangin in the players theater. Cholcatt's musical talents have also been resourced by 5 time grammy award winning artist Lauryn Hill for The Miseducation of LaurynHill album and tour, Carlos Santana, Savion Glover, Usher, Rihanna, Alicia Keys, Aretha Franklin, Beyonce and Gregory Hines to name a few. Choclatt has also been featured in television commercials for Metro PCS, Capital One Bank, CBS sports network, Cingular Wireless, Burger King, Citi bank and Panasonic. His TV show credits include NBC's 30 Rock Starring Alec Baldwin and Tracy Morgan, "Are We There Yet" starring Ice Cube and Terry Crews. His movie credits include "Conspiracy Theory" starring Mel Gibson, "Sliver " starring Sharon Stone and "Listen to your Hart" starring Cybill Shepherd and music scores for CBS's Blue Bloods starring Tom Selleck as well as "Heat" starring Robert Denero. Currently, Choclattjared is performing his series of mixtape's entitled "DRUMTANTRUMS " with his live band Innboxx every where. DRUMTANTRMS present his vocal and sophisticated Bucket, Acoustic and Electric drum scores with edgy complex beats and aggressive fills that are sure to captivate any audience.